In this photo provided by Nintendo of America, devoted fans dress in Pokemon themed costumes and gather at Nintendo World in New York on Oct. 11, 2013, to celebrate the arrival of the Pokemon X and Pokemon Y video games for the Nintendo 3DS family of systems, including the new Nintendo 2DS. In this photo provided by Nintendo of America, Pokemon fans gather at Nintendo World in New York on Oct. 11, 2013, to participate in Pokemon activities including a costume showcase, interactive on-stage events and game sampling to celebrate the launch of the Pokemon X and Pokemon Y video games for the Nintendo 3DS family of systems, including the new Nintendo 2DS. In this photo provided by Nintendo of America, eager fans wait at Nintendo World in New York on Oct. 11, 2013, to be among the first in the U.S. to purchase the newest Pokemon video games: Pokemon X and Pokemon Y for the Nintendo 3DS family of systems, including the new Nintendo 2DS. 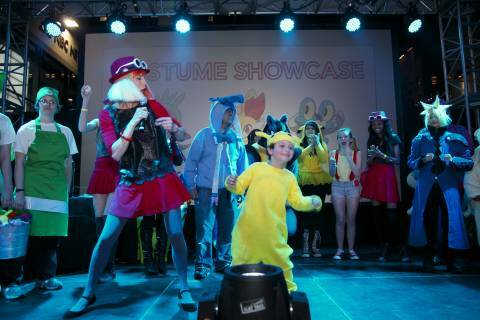 At the special launch event, attendees had the opportunity to purchase the games and participate in activities inspired by the Pokemon franchise. In this photo provided by Nintendo of America, Pokemon fans wait in line at Nintendo World in New York on Oct. 11, 2013, to be among the first in the U.S. to purchase the Pokemon X and Pokemon Y video games for the Nintendo 3DS family of systems, including the new Nintendo 2DS. In this photo provided by Nintendo of America, Zoe A. from New York, NY, becomes the first consumer at the Pokemon X and Pokemon Y Launch Celebration event at Nintendo World in New York to purchase the Pokemon Y video game for the Nintendo 3DS family of systems on Oct. 11, 2013. 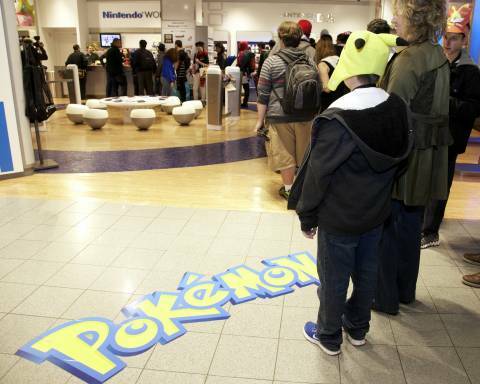 In this photo provided by Nintendo of America, fans gather at Nintendo World in New York on Oct. 11, 2013, to play the Pokemon X and Pokemon Y video games for the Nintendo 3DS family of systems, including the new Nintendo 2DS. 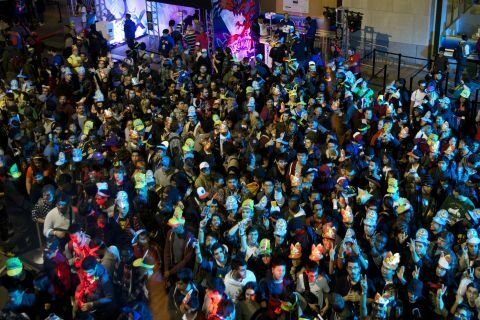 In this photo provided by Nintendo of America, the first wave of Pokemon fans eagerly await their chance to purchase Pokemon X and Pokemon Y at Nintendo World in New York just after midnight on Oct. 12, 2013. 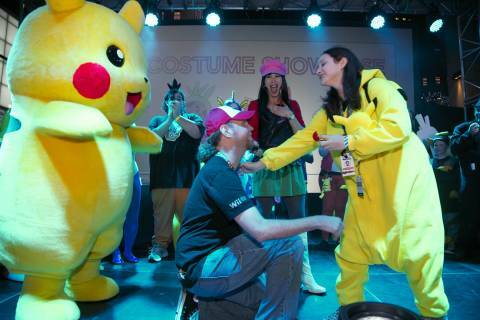 In this photo provided by Nintendo of America, Debbie G. from Long Island, NY says yes to Jeff W. from Long Island after he proposes to her at the Pokemon X and Pokemon Y Launch Celebration event at Nintendo World in New York on Oct. 11, 2013. Jeff and Debbie are both avid Nintendo fans who co-founded the Long Island StreetPass group together. The Pokemon X and Pokemon Y video games are playable on the Nintendo 3DS family of systems, including the new Nintendo 2DS. In this photo provided by Nintendo of America, devoted fans dress in Pokémon themed costumes and gather at Nintendo World in New York on Oct. 11, 2013, to celebrate the arrival of the Pokémon X and Pokémon Y video games for the Nintendo 3DS family of systems, including the new Nintendo 2DS. In this photo provided by Nintendo of America, Pokémon fans gather at Nintendo World in New York on Oct. 11, 2013, to participate in Pokémon activities including a costume showcase, interactive on-stage events and game sampling to celebrate the launch of the Pokémon X and Pokémon Y video games for the Nintendo 3DS family of systems, including the new Nintendo 2DS. In this photo provided by Nintendo of America, eager fans wait at Nintendo World in New York on Oct. 11, 2013, to be among the first in the U.S. to purchase the newest Pokémon video games: Pokémon X and Pokémon Y for the Nintendo 3DS family of systems, including the new Nintendo 2DS. 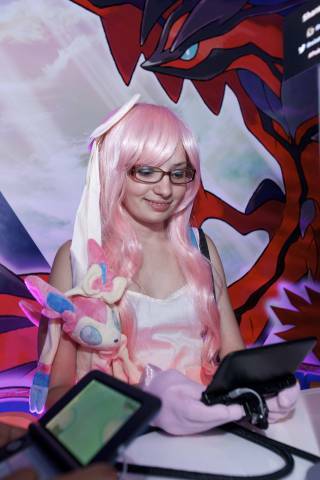 At the special launch event, attendees had the opportunity to purchase the games and participate in activities inspired by the Pokémon franchise. In this photo provided by Nintendo of America, Pokémon fans wait in line at Nintendo World in New York on Oct. 11, 2013, to be among the first in the U.S. to purchase the Pokémon X and Pokémon Y video games for the Nintendo 3DS family of systems, including the new Nintendo 2DS. 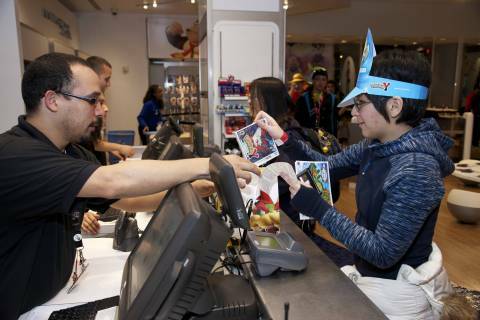 In this photo provided by Nintendo of America, Zoe A. from New York, NY, becomes the first consumer at the Pokémon X and Pokémon Y Launch Celebration event at Nintendo World in New York to purchase the Pokémon Y video game for the Nintendo 3DS family of systems on Oct. 11, 2013. 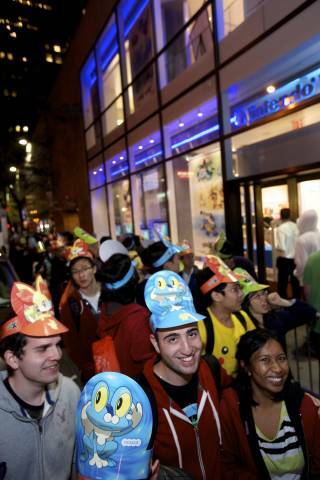 In this photo provided by Nintendo of America, fans gather at Nintendo World in New York on Oct. 11, 2013, to play the Pokémon X and Pokémon Y video games for the Nintendo 3DS family of systems, including the new Nintendo 2DS. 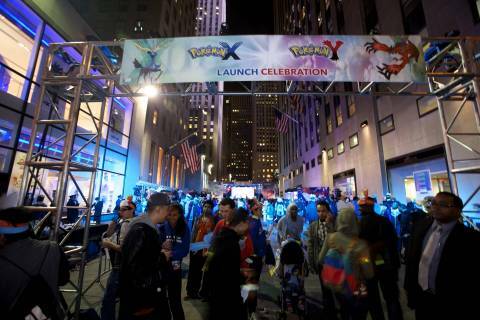 In this photo provided by Nintendo of America, the first wave of Pokémon fans eagerly await their chance to purchase Pokémon X and Pokémon Y at Nintendo World in New York just after midnight on Oct. 12, 2013. In this photo provided by Nintendo of America, Debbie G. from Long Island, NY says yes to Jeff W. from Long Island after he proposes to her at the Pokémon X and Pokémon Y Launch Celebration event at Nintendo World in New York on Oct. 11, 2013. Jeff and Debbie are both avid Nintendo fans who co-founded the Long Island StreetPass group together. The Pokémon X and Pokémon Y video games are playable on the Nintendo 3DS family of systems, including the new Nintendo 2DS.